A soldier is reluctantly presented as a war hero during the halftime show of a Texas football game. 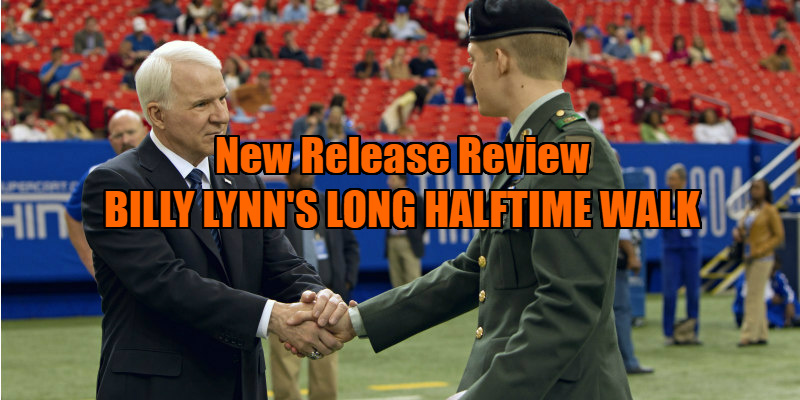 Six month's ago, Ang Lee's latest drama, Billy Lynn's Long Halftime Walk, was touted as a possible Best Picture/Director contender. On paper, it boasted an acclaimed, award winning director, a heady theme and technological innovation, but as soon as critics in the US finally got to see Lee's film on the festival circuit, and with Stateside cinema-goers giving it a wide berth, such potential was dashed. Panned by reviewers and shunned by audiences across the Atlantic, Billy Lynn now shuffles quietly into UK/ROI cinemas on a limited release. As the title suggests, the drama takes place during a sports event, an American Football match held in Texas, home state of the eponymous protagonist (Joe Alwyn), a nineteen-year-old soldier declared a national hero after footage of his attempt to save the life of his Sergeant (Vin Diesel) during a skirmish in Iraq went viral. Along with the members of his outfit, led by the no nonsense Sergeant Dime (Garrett Hedlund), Billy is guest of honour at the big game, where he finds himself shuffled around by PR assistants, patronised by team owner Norm Oglesby (Steve Martin) and felt up by a cheerleader (Makenzie Leigh) with a fetish for a man in uniform, all while debating whether or not to follow his sister's (Kristen Stewart) plan to visit a doctor and have himself declared unfit to return to Iraq. Prior to its release, much of the talk around Billy Lynn concerned Lee's decision to shoot the film at an unprecedented 120 frames per second. Such a frame rate, five times that of the regular 24fps, was in theory supposed to create an image appropriating that of how the human eye processes information, thus creating the illusion of reality. The trouble is, only a handful of cinemas around the world are equipped to project the movie at this rate, and critics who got to see the movie in such an environment complained that the image clarity proved a distraction. Seeing it in a regular cinema, Lee's film resembles behind the scenes footage, or an '80s shot on video TV show (Robert Altman's Tanner '88 springs to mind). They say the camera adds 10 pounds, but 120fps seems to add 20, with normally chiselled actors here resembling DiCaprio after a long weekend in Monaco. A few years ago this may have proved a stumbling block, but in recent years with the rise of digital we've become accustomed to poor quality images in the same way we now accept the loss of fidelity in mp3 recordings. Billy Lynn isn't a bad movie for any technical reasons. It's a bad movie because its script is a mess. Set in 2004 at the height of the Iraq conflict, Billy Lynn feels like a period movie, but it also feels dated. In the decade since, America has changed its methods of conducting foreign wars, with drone pilots in Nevada portacabins waging warfare against an unsuspecting enemy on the other side of the world. If Billy Lynn is critiquing an American policy, it's a decade late to the game. That's if its intention is to critique and satirise its subject. Lee's direction and Jean-Christophe Castelli's script are so tonally muddled I couldn't figure out if the movie was celebrating the spirit of heartland America or outright mocking it. When Leigh's cheerleader speaks of her love of God and country, is Lee asking us to respect her sincerity or laugh at her gullibility? I honestly have no idea. There are snippets that suggest the compelling drama this might have been, but they come from a cast that commendably commits itself to a confused vision. Newcomer Alwyn has a charming sensitivity, Hedlund is entertaining as he chews through his many monologues, and Stewart steals the show in her all too rare appearances. However, such noble turns can't save Billy Lynn from itself. Lee indulges in a level of outright cheesiness that's remarkable for such an experienced filmmaker. Flashbacks to Lynn's time in Iraq are edited in a manner that provokes groans, with every explosion of fireworks in the football stadium followed by that of an incendiary device in the warzone. The worst moment of all concerns an 'appearance' by Destiny's Child in which the three singers are shot from behind to disguise the fact it's not actually the real group. When 'Beyonce', a laughably unconvincing extra in a blond wig, waves to Lynn, I couldn't help but think of the Fawlty Towers episode in which Polly has to dress up as Cybil for some reason or other. What was Lee thinking? 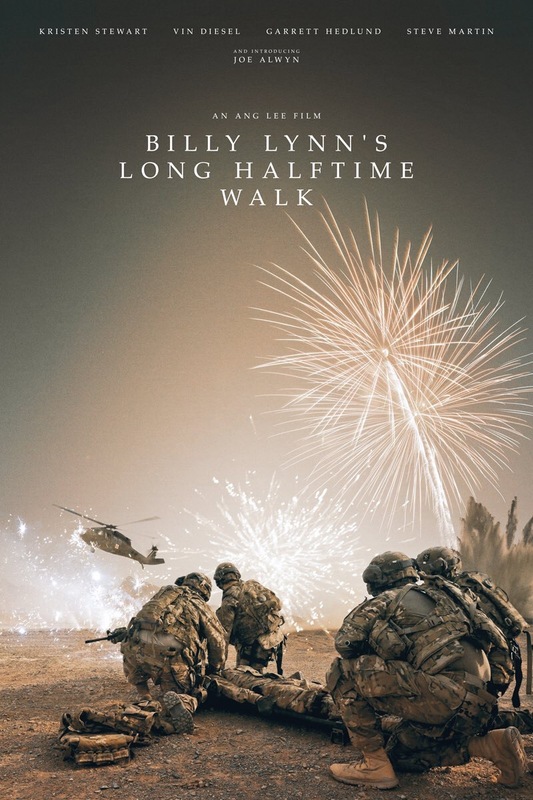 Billy Lynn's Long Halftime Walk is in UK/ROI cinemas now.